When preparing a meal or dessert involving tortillas, you’re probably going to run into a fierce debate as to whether to go with flour or corn tortillas. While there is no surefire answer in which one is better, we can at least help steer you towards making a decision the next time you’re wondering which tortilla type to choose. 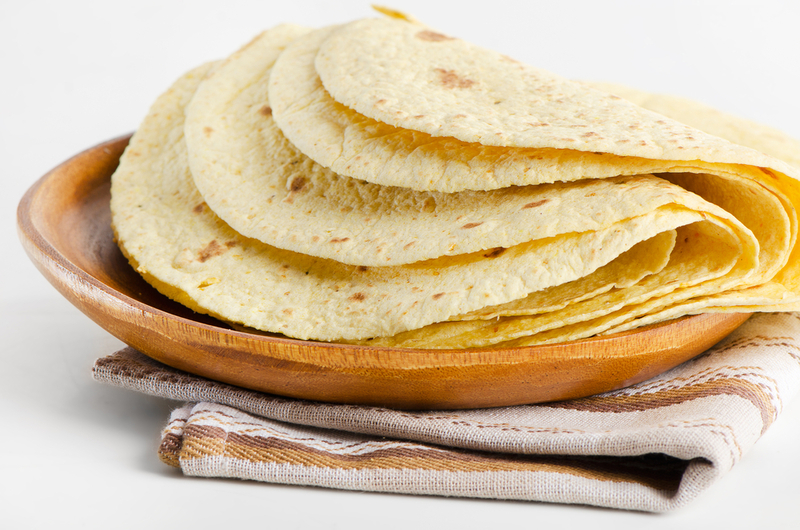 Corn tortillas have been around longer than flour. Maize has been a staple in Mexico for hundreds of thousands of years, and there is evidence that the Mesoamerican diet involved corn, among other foods. It was during the 1500s that Spanish Conquistador Hernán Cortés coined the term “tlaxalli” (tortillas) which means “little cakes”. Corn tortillas are the preferred type in the southern area of Mexico. They have texture, they are flavorful, and they are a great complement to whatever filling you use. Additionally, the fact that they’re gluten-free and low in carbs makes them a good choice for those on a diet. When you need something that offers pliability, flour tortillas are a safe bet, especially when you’re preparing huge tacos with lots of salsa. Flour tortillas are believed to have come about when Spanish missionaries found corn tortillas to be unfit for consumption. With the weekend approaching, we’re keeping things simple with an easy to prepare chickpea tortilla casserole recipe that’s also vegan-friendly! Without further ado, let’s get started. Begin by preheating your oven to 350 Fahrenheit. After breaking off the cauliflower florets, steam them until they become tender and then put them aside for now. Using medium-high heat, saute the mushrooms, garlic, and onion until juicy. Use a half a cup of water to boil the Brussels sprouts and then turn down the heat to medium. Cover it up and cook for about ten minutes or until tender. Blend the cauliflower with the lemon juice, steam water, yeast, seeds, and chicken seasoning until the mixture is smooth. Pour the sauce into the vegetable mixture, making sure to leave behind a cup and a half. Follow by stirring in the chickpeas. Using a casserole dish of 9×13 inches, spread the sauce onto the bottom of it. Place a layer of tortillas on top of the sauce and then spread half of the bean/veggie mixture over them. Place a second layer of tortillas and then top it with whatever veggie mix you have left. Bake at the same 350-degree temperature for about fifteen minutes or until it begins to bubble. 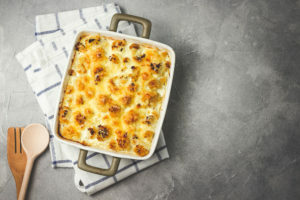 Today’s recipe will take significantly longer than some of the other ones we’ve highlighted recently, but the end result is definitely worth it. For this sweet potato and black bean burrito recipe, you can opt for something vegan-friendly if the Greek-style yogurt doesn’t sound appealing. Begin by preheating your oven to 350 degrees. 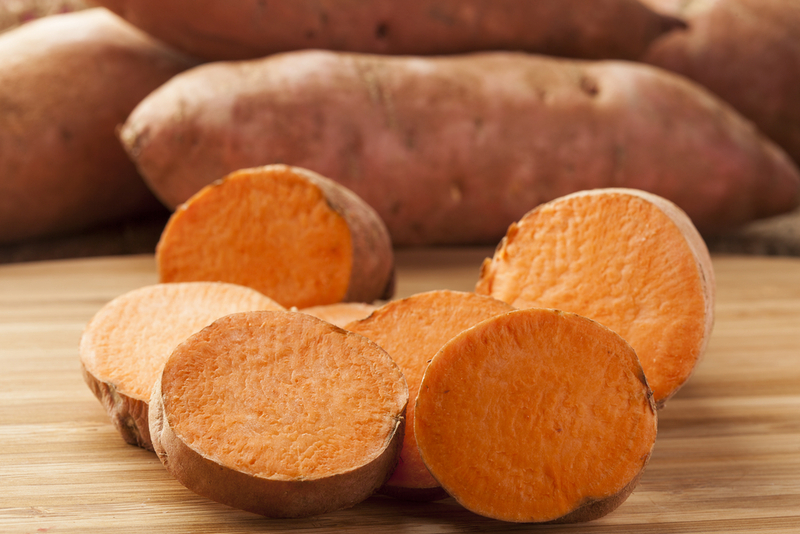 Use a fork to prick the sweet potato all around and then place it on a small baking tray before baking for about fifty minutes or until it’s entirely soft. Remove it from the oven and allow it to cool. Turn the oven off and scoop out the flesh from the potato to place into a large bowl. Place half of the beans in a food processor along with the walnuts and then blend them until smooth. Follow by adding the flesh of the sweet potato along with the onion and garlic powder, the remaining black beans, herb mix, and the paprika. Season with the pepper and salt and then mix well. Use baking parchment to line the baking tray. Divide the mixture you just made into a quartet of portions and then mold it into a log-like shape of about 6 x 2¾ x ¾ inches. Sightly flatten them before allowing them to chill for at least two hours. Fire up the oven to the same temperature as before and cook the patties for fifty minutes. While that’s cooking, mix the yogurt and paste together in a bowl. Once the patties are ready, place tortillas in the oven for a minute until they’re warm but pliable. Use a big spoonful of the yogurt mix to spread across each tortilla before adding a potato patty in the middle of it. Top with the beetroot, lettuce, and carrot. Slice a quarter of the avocado in half and place both pieces on top before tightly rolling the tortilla around the filling. Slice it in half and you’re ready to serve. Valentine’s Day 2018 has come and gone. 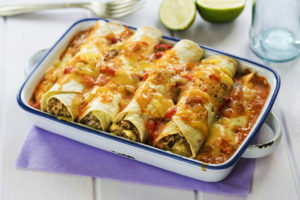 If you’re nursing a broken heart, today’s post is a lighthearted take on a classic tortilla favorite: enchiladas. In this case, it’s an “Engaged Ex Enchilada”. Here is what you’ll need to make about six of them. Begin by preheating your oven to 375 degrees. Grab a 9×13 inch baking dish and grease it down with the olive oil. Use a large pot to place the kale/chard and sweet potatoes in and then fill it with three cups of water. Place the pot over medium-high heat, cover it with an appropriate lid, and allow it to boil. Once it’s boiling, turn the heat down to medium-low and allow it to simmer until the potatoes are cooked through, about ten minutes or so. Remove the pot from the heat, drain, and then season with the pepper and salt. Place the tortillas in the microwave for about thirty seconds until they become soft. 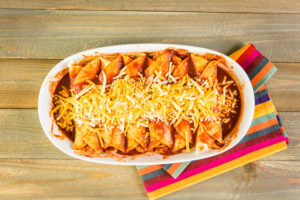 Use a mixing bowl to pour the enchilada sauce into, dip one of the tortillas into it, and then remove, making sure to remove any leftover sauce. Place the tortilla on a flat surface and then add about two tablespoons of the kale-potato filling and a sizeable sprinkle of cheese to the tortilla center before rolling it up. Making sure the seam side is facing down, place the tortilla into the pan you originally prepared and repeat the previous steps with the rest of them. Make sure to leave about half a cup of cheese to top the tortillas. When ready, pour the sauce over the rolled tortillas you placed in the pan and top with the cheese. Bake them for at least thirty minutes or until the cheese has begun to bubble. Every once in a while we will highlight an enchilada recipe and that’s exactly what we’re doing today. 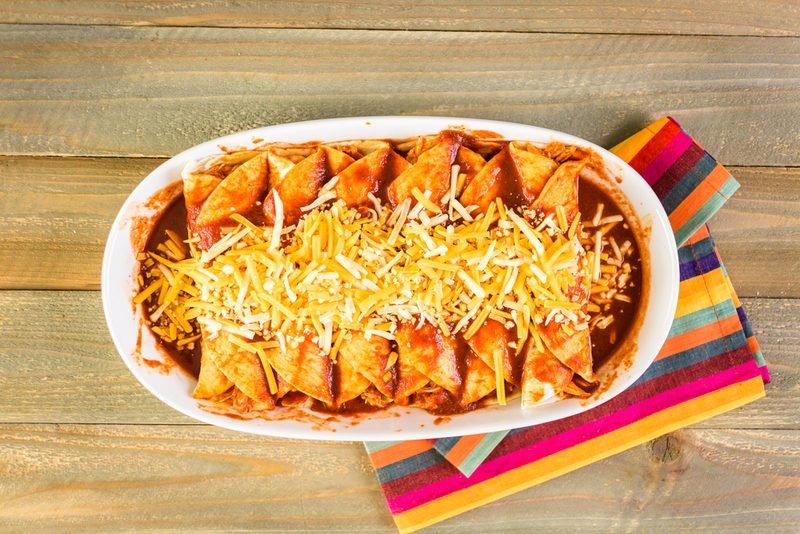 For those of you always seeking to add a new spin on your enchiladas, this Swiss chard enchilada variation might suit your taste! Twelve cups of Swiss chard with the ribs removed and the leaves roughly chopped. For the salsa, place the jalapeños and tomatillos in a medium pot and cover them with water. Allow the contents to boil before turning down the heat to medium and allowing it to simmer until the tomatillos have softened. The process should take about eight minutes. Follow by draining. Once you’re done with that step, move the cooked jalapeños and tomatillos over to a blender and add about half of the garlic, a trio of cups of cilantro, another trio of cups of chard, and three tablespoons of crema. Season with salt and puree the mixture until everything is smooth. Using a medium pot, heat three tablespoons of oil over medium-high heat. Pour the salsa in and allow it to simmer until it becomes slightly thick. This step should take about five minutes or so. Once it’s time to make the filling, use a saute pan to heat a pair of tablespoons of oil over medium-high heat. Thinly slice whatever garlic you have left and add it to the pan, allowing it to saute until it becomes lightly golden and aromatic. Follow by adding whatever chard you have left and allow it to saute until the leaves are wilted but still chewy. Turn the heat off, stir the Oaxacan cheese in, and season with salt. Use another pot to fill it with whatever oil is left and set it over medium heat. Once it starts to bubble, turn the heat down to low. Use a pair of tongs to dip the tortillas into the oil, making sure to do only one at a time. Once the tortilla is puffed but not yet browned, place it on a plate and add any oil you may need. Each tortilla should be dipped about fifteen seconds. Divide the tortillas between four plates and top them with the filling. Roll them around the filling to create cylinders and arrange with the seam side facing down. Use a generous spoonful of the salsa over rolled tortillas and then garnish with any crema, queso fresco and cilantro leaves you may still have. 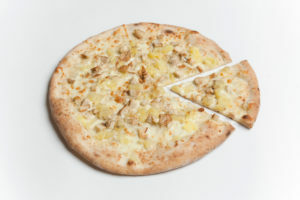 As much as the majority of us love a good slice of pizza, we all know it’s not the healthiest choice of food when it comes to sticking to a diet. 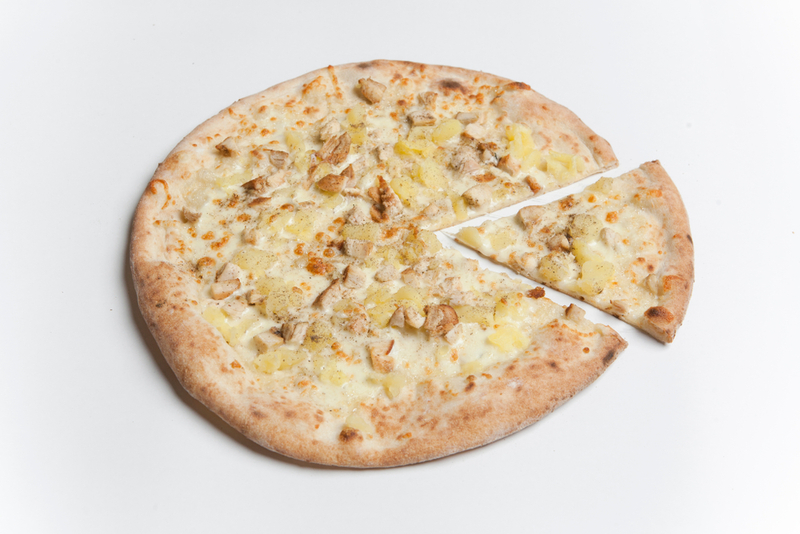 Today’s recipe features a healthy thin crust that will help you stay on track, or at least allow you to enjoy a tasty pizza on your cheat day. Begin by preheating your oven to 375 degrees and then use a nonstick spray on a baking sheet. Place the tortilla on the sheet and allow it to bake until it’s slightly crispy, about five minutes or so on each side. While the tortilla is being prepared, mix the mozzarella and ricotta cheese in small bowl. Using a skillet sprayed with the nonstick spray, turn the oven to medium heat. Cook and stir the onion until it’s brown and soft, which should take about four minutes. Follow by adding the spices and the cheese mix, making sure everything is thoroughly combined. Spread the new mixture over the tortilla, making sure to leave a border of half an inch and then top it with the basil and tomato. Bake for about five minutes until it’s hot and you’re ready to serve.